Rhino Gear makes a wide variety of custom and off-the-shelf helical gears that provide advantages in all kinds of applications. Helical gears have teeth that are set at an angle. They're very similar to spur gears, except the teeth of a helical gear are cut at an angle to the axis or hole. 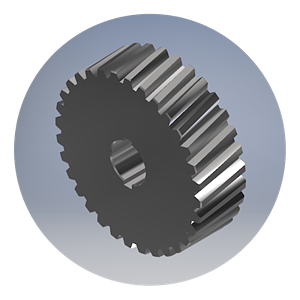 These teeth typically engage more slowly and smoothly than other types of gears used for similar applications because the load is transferred uniformly and gradually. This results in superior performance, reduced noise and vibration. When used on parallel shafts, helical gears are like spur gears, but generally provide a stronger, smoother running gear train. Helical gears are made in both right and left-hand configurations.